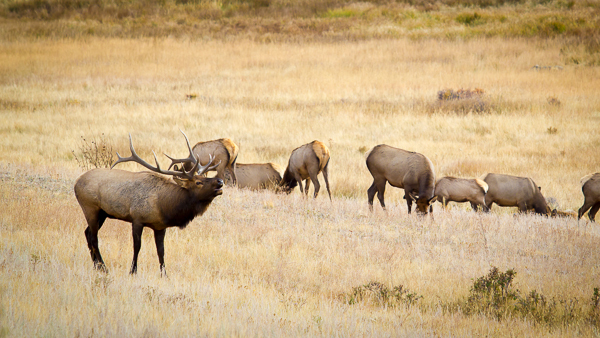 One of the most popular reasons to visit Estes Park, Colorado and Rocky Mountain National Park is to see the abundant wildlife that call this corner of the Rockies home. And we see it all here at McGregor Mountain Lodge. Literally. We have seen each of the main large mammals that folks come to see, right here on the property. This includes elk, mule deer, moose, bighorn sheep, black bear, coyote, bobcat, and mountain lion. We have also seen just about all of the smaller critters, such as fox, stoat, rabbit, and marmot. While you could sit in your cabin and wait for the animals to show up, this article is meant to give you a nudge in the right direction so you can get out and see them other places as well. We'll divide this up a couple of ways. We'll separate each of the large mammal species and give you a little info about them and where the best places to see them really are. We'll also give tips on how best to see them in various seasons, as the time of year can certainly effect the likelihood of actually spotting the beasts. The big show. This is what most folks come to Estes Park to see. They. Are. Everywhere. It's really pretty easy to find elk in any season and you will most likely see your fill before you leave town to head back home. It always baffles us when we have guests that say they haven't seen any elk on their trip. While it occasionally happens it's definitely the extreme exception to not see a single elk. You'll probably see hundreds. The best places to see elk are in open mountain meadows, or 'parks', in both Estes Park and inside Rocky Mountain National Park. The golf courses in town are a great place to spot elk in the autumn, winter, and spring. As well as Moraine Park, Horseshoe Park, and Beaver Meadows within RMNP. In the summer months, you may have better luck hitting Trail Ridge Road as the elk tend to enjoy the cool summer days at higher elevations. Anytime of year is great. The elk are at lower elevations in the park and around town in the autumn, winter, and spring. Once the grass starts greening in and around town in April/May there will be big herds around the golf courses. Then the elk follow the greening grass as the higher elevations shed their winter coats of snow and springs new growth emerges. Actually, you'll have great luck just driving around in search of elk. You can come across herd on the trail but it's easier to cover more ground in your vehicle. 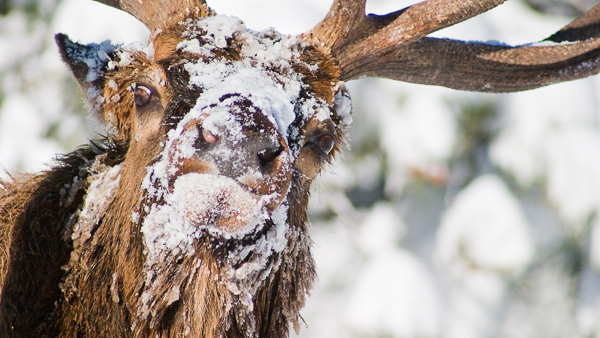 For an up close and personal experience with elk, visit us between November and May and you'll get to meet our resident elk, Brat and Sven (among others). They spend every winter with us and may even nap on your front porch all day long! Just call us from your cabin and we'll shoo them away if need be! The nice surprise of the area! 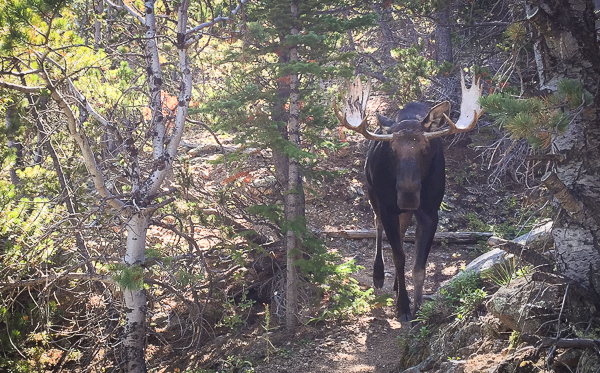 Traditionally a "west side" treat, moose are establishing themselves quite well on "our side" of the national park. There are more and more sightings each year with some even wintering in town here. However, moose are tricky to find. Ask around as they tend to hang in their same favorite spots so can be fairly predictable which can make it easier to spot one. Prolific on the west side of the park, you need to try a bit harder on our east side. Head up to the Sprague Lake area at dawn or dusk. There have been sightings in Wild Basin over the past couple of years as well. I ran into a HUGE bull on the North Longs Peak Trail as he was taking a stroll munching on Aspen leaves on the side of the trail. Anytime of year is as good as any other. Winter may make them a bit more predictable as they tend to move shorter distances due to snow and food source availability. Dawn and dusk seem to be better times of day. While you may get lucky and see one from your car, here on the east side of the park it seems like hitting the trails in areas where they have been spotted is a better method and gives you a better chance of spotting one of these massive animals. Keep your distance and never approach a moose. Never approach any wildlife, but moose can be extremely aggressive, so take extra care of you see one. Check in with us at the lodge and definitely touch base with a ranger at one of the visitor centers. The best way to find out where they have been seen is through word of mouth. Mule Deer are prolific throughout Estes Park. We see them daily at the lodge and around town. They usually move about in family groups and not in huge herds like the elk so you probably wont see as many "mulies." These are quirky and beautiful animals and always a joy to have around. Really anywhere in the Estes Valley and Rocky Mountain National Park are great spots to find mule deer. There are many on our south facing slopes from the lodge and back toward town. Lumpy Ridge is another area with healthy and visible populations as well as Horseshoe and Moraine Parks. You can find them at higher elevations throughout the national park during the summer months after the snow has melted. Dawn and dusk are the best times to see mule deer but you will spot them at all times of the day. In the winter there will be more at lower elevations and, like many other animals, they move up higher during the summer. These guys are easy to find. Drive around to spot them or hit the trails and you'll probably have the same luck. They are all over the place. The do tend to like the sunny south facing slopes, especially in the winter. Deer Mountain is named that for a reason. The main Deer Mountain Trail, that leads to the summit, is a great trail to spot mule deer. There is also a trail across the road from the Deer Mountain Trailhead that heads downhill for a mile leading to Upper Beaver Meadows. I bet I see mulies along this stretch 75% of the time I hike it. This is a huge draw to the area. 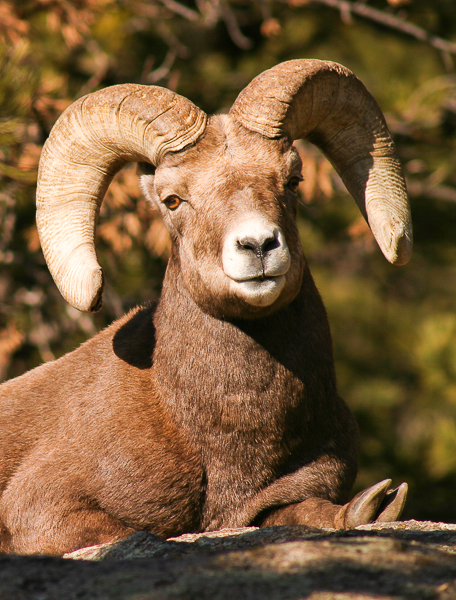 Estes Park is one of the best and easiest places to spot bighorn sheep in the entire country. And McGregor is, historically, one of the best places to spot bighorn in Estes Park. There are two main herds. The Black Canyon Herd, characterized by their darker coats as they tend to stay in Black Canyon for most of the year, below tree line so have a darker coat as a result. The other hers is the Mummy Herd. They have a lighter coat due to the fact that they stay higher, often above tree line, in the Mummy Range so their fur gets bleached by the intense sun at altitude. We see both herds, or parts of both herds, here at McGregor. 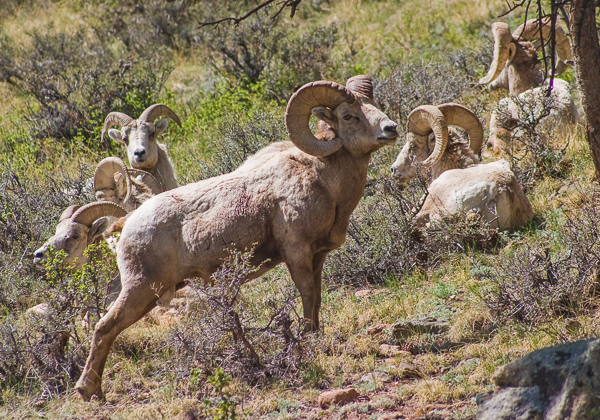 There are a few places in Estes and RMNP that give you a pretty good chance to see bighorn. The south facing slopes of Bighorn Mountain, McGregor Mountain, and Castle Mountain are about as good as it gets in and around town. Basically from Sheep Lakes in Horseshoe Park to Castle Mountain Lodge and Nicky's just outside of town is where you'll see them. Some other spots that require a bit of effort: Above Lawn Lake high in the Mummy Range. This is a +/- 7 mile, one way hike, but they are often seen below The Saddle. Also along the Continental Divide from Milner Pass below Mt. Ida. Again, a +/- 6 mile, one way hike. But I think I've seen bighorn every single time I've hiked that trail. Bighorn follow no schedule. They aren't your typical dawn or dusk mammals. In fact, if I had to pinpoint a time they are most often seen it would be around lunch. We see them around town more in the winter and spring and higher in the park in the summer. Drive up and down Hwy 34 between town and the Fall River entrance to the national park and simply look to the south facing slopes on the north side of the road. Some folks have luck sort of camping out at Sheep Lakes in the national park and hope they show up, but that doesn't seem like an attractive way to find wildlife... but to each his own. Bring a lunch, a pair of binoculars, and a pack full of patience. Otherwise, hit the trails. Head up to Ida or into the heart of the Mummy's and keep your eyes peeled! Head out about 11:30am. Drive up and down HWY 34 (Fall River Road) from about Castle Mountain Lodge to the Fall River Entrance to RMNP. Look to the North (the side of the road McGregor is on). The most common spots to see them along this stretch is here at the lodge (or about a quarter mile to the west on the open mountainside) and then east to Amberwood, another resort just down the road. You can certainly see them a bit beyond these spots on either end, but they are more commonly seen on this stretch. Cute young Bear here at the lodge. June 2012. Count yourself lucky if you see a bear! While we do see them relatively often, it's always a treat and we can certainly remember each time we've seen them over the past 15 years. We only have Black Bears here in the Estes Valley (and in Colorado). No Grizzlies. However, Black Bears, as a species, can vary in color from almost blonde, to cinnamon red, to dark black, and every shade in between. But rest assured that we only have Black Bears in our neck of the woods. While black bears are quite harmless and would rather keep their distance from you, you must always show them respect and keep the distance yourself. These are extremely fast, agile, and unbelievably strong animals and could do some serious damage to you very quickly if they feel threatened in any way. While it will be tempting to try to get closer for a better picture if you see one, don't give into that desire. Stay far away and simply enjoy the experience and count your lucky stars you even got to lay eyes on one. 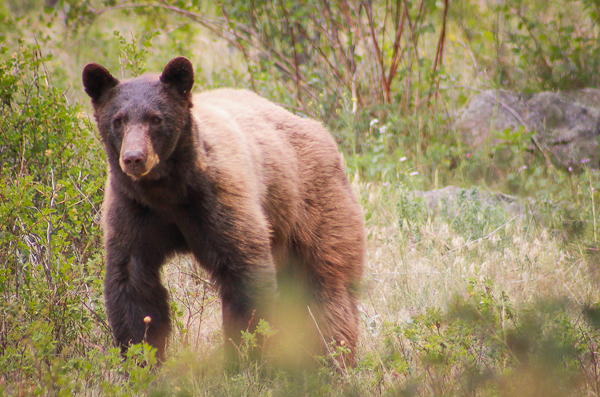 Black Bears can be seen throughout the Estes Valley and Rocky Mountain National Park. I've seen them in my backyard, downtown, here at the lodge, Moraine Park, Hollowell Park, Bear Lake Road and in Wild Basin. And they are spotted throughout the area. Just keep your eyes peeled. While they are seen from Spring through Autumn, they become very active in those Fall weeks leading up to the first big snows. They are really trying to pack on the pounds before they enter their torpor. An interesting fact is that Black Bears don't truly hibernate. They enter what's known as a state of torpor. It's similar to true hibernation but on a slightly reduced scale. The animals will enter a state of reduced body temperature and metabolic activity so as to survive the long winters with limited food. But on warm days in the winter, Black Bears have been known to come out for a few hours of foraging before retreating into their dens for some more zzzz's. As far as time of day, you will usually see black bears during the daylight hours. You may catch them napping in a tree downtown, or in the park, or moving from dumpster to dumpster trying to break in. However, they are definitely more active at night, it's just harder to see them, for obvious reasons. The best way is to cover a lot of ground. Drive around and hope you get a glimpse of one crossing the road. Ask rangers where they have been spotted recently (the past 12-24 hours) in RMNP, and ask us here at the lodge. We often hear of current sightings in and around town from friends. But there really isn't a sure fire method that gives any certainty to seeing these awesome beasts. You will need to have a bit of luck on your side. In September/October we will have a bear visit the property on most nights. Depending on their mood, they may stick around and explore the property for a couple of hours, or just buzz through on their way to greener pastures. But we hear countless stories from guests. They were sitting out on the porch at dusk only to have a bear turn the corner on the side of the cabin and scare everyone, including the bear, half to death! Also, while we do have a bear proof dumpster, it doesn't stop them from trying to break in. So if you hear banging on the dumpster in the middle of the night, throw a robe on, hop in your car (please don't walk over there), and drive over to the dumpster and you'll probably get a glimpse of the bear running away from you in your headlights. Good luck! While there is a very healthy population in our area, and a healthy population on McGregor Mountain, is it VERY rare to see one of these truly magnificent creatures. They actively try to stay hidden and out of site, move around at night, through drainages that provide a lot of cover, and can have relatively large territories. You can see mountain lions throughout Estes Park and RMNP. Rough terrain with a lot of cover in the form of drainages, rock outcroppings, brush, etc, is where they frequent, but this also makes it harder to spot them. At night. While there have been sightings in the middle of the day, it's pretty rare. The only times I've seen one in the sunlight was right at dawn or dusk. Once was a big cat crossing the road on the south side of Deer Mountain at about 6:00am in August, and it had 3 coyotes hot on its tail. The other time was at dusk as I was coming back from hiking in the park. I was about 80 yards from turning back into the lodge driveway and I saw a lion running down through the middle of the property here at the lodge. It crossed the road heading downhill and was gone. The other few times I've seen them have been after dark. A couple of times while driving, and a few times when I'd go up to observe a kill just above the property here, where the lion would return each night to feed on a young elk it had brought down. Your best bet is in your vehicle. Driving around at dawn or dusk in areas with a lot of Mule Deer seem to be relative hot spots. And you'll need a strong dose of luck as well. I know folks who have lived here for decades and never seen one. But I also know guests who have visited only a handful of times who have had several sightings. May the force be with you. There really isn't anymore we could tell you. But, the more you get out and look, the better your chances. You wont see one while you're sitting by the fire in your cabin. I'll break it down into seasons with a short little list of what animals are more often seen in which seasons and where. Obviously, this is a very rough "guide" and by including an animal in a season may mean that it's easily visible in an entirely different altitude zone or area of the park. For example, you typically wont find a mule deer and a pika in the same spot. But they may both be easily found during the same season. Hope this can be helpful! 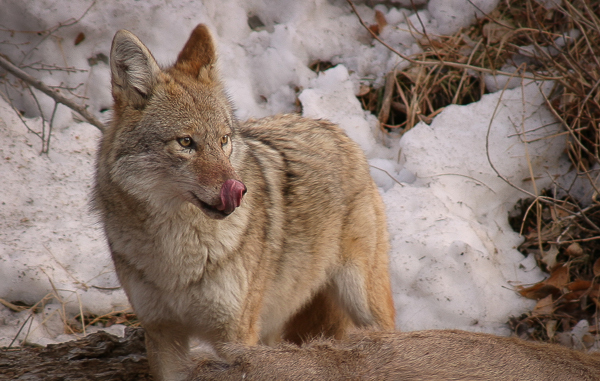 Coyote feeding on an Elk. November 2004. Winter is a great time for wildlife watching. It concentrates most of our big species into the lower elevations around town. While some animals, such as Bears, Marmots, Pika's, etc, wont be seen, you're almost guaranteed to see elk and mule deer daily. 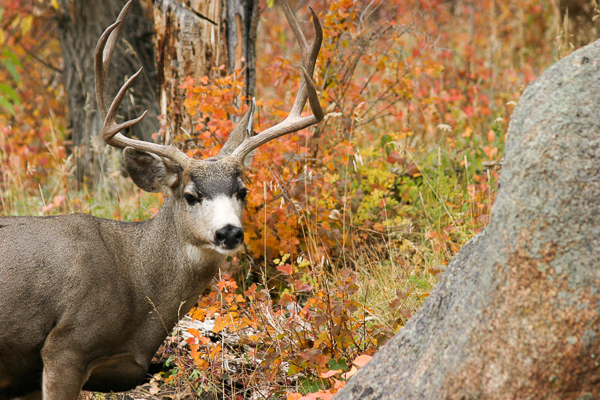 What to expect: Elk & Mule Deer. And a lot of them. 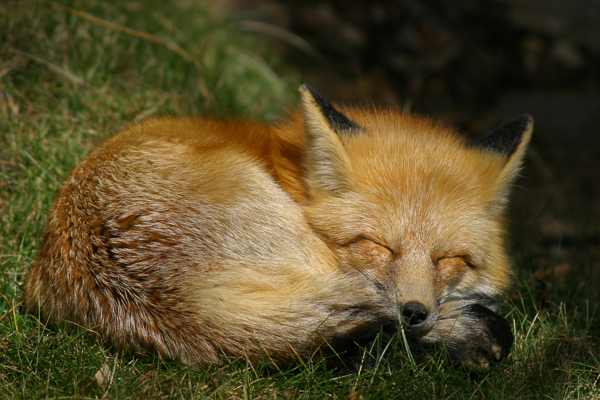 A fox enjoying a nap in the warm sun and newly green grass! Much like winter, spring is fantastic for spotting wildlife around town. And, can you say BABIES??!! The elk and mule deer drop their calves during the late spring and it's a glorious time as the rest of the landscape is coming alive as well. And just a note, be sure to give mamas and their calves a TON of space. Especially the elk can be extremely aggressive surrounding birthing time. Mule deer can be as well. What to expect: Elk, Mule Deer, and their little ones! Moose on the west side of RMNP. 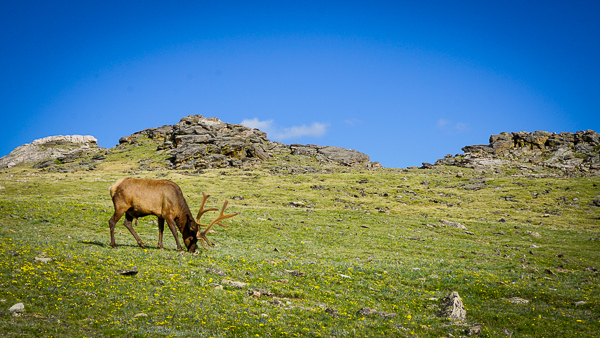 Brat, "our" resident elk, enjoying his summer months in the tundra. Spotted on Trail Ridge Road at 12,000 feet. While spread out over a larger area due to the snow being gone in the Alpine, summer is a wonderful time to do some wildlife watching. Great weather, active animals, and long days make for a near perfect wildlife watching experience. 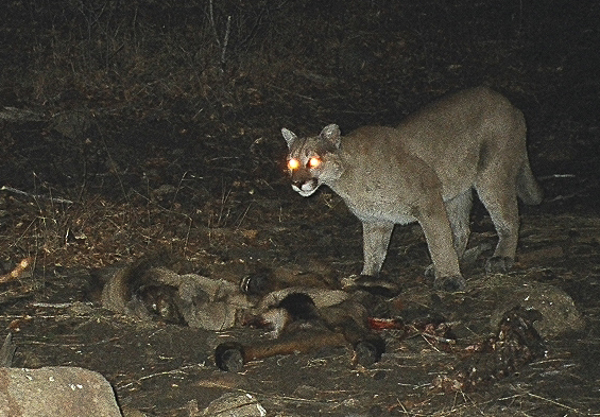 Possible: Bears, Bobcats, Mountain Lions, Badgers. Smaller Critters: Fox, Rabbits, Stoats, Martins. Bugling Elk in Moraine Park, Rocky Mountain National Park, Colorado. If you want to see elk in all of their glory, come in the autumn. It's the big show. The days are getting shorter, crisper, the aspen are turning their signature hold, and the sound of elk bugles echo through the valleys. Not sure it gets much better. Again, this is a rough guide about most of the animals that folks come hoping to get a glimpse. It won't be 100% accurate but should give you an idea of what to expect and hopefully help point you in the right direction so you can see what you came here to see! If there is an animal you want more info about, on the list or not, please leave a comment! Thanks and remember to always give our wildlife plenty of space. Use a telephoto lens to get close... not your legs. And never, ever, feed the wildlife. Bighorn sunning above the lodge. Wonderfully written. Or better yet wonderfully expressed. The pictures and the text complement each other nicely to give a tasteful reading experience for the reader. I believe this web site contains very superb composed articles posts . Yogi Bear’s Jellystone Park Of Estes! This is how to get your foot in the door. Yogi Bear\'s Jellystone Park Camp - Resort in Branson, MI.